FORUM FOR STENOGRAPHERS: CONGRATULATIONS TO ALL (SELCTION GRADE) EMPLOYEES. CONGRATULATIONS TO ALL (SELCTION GRADE) EMPLOYEES. thanx u phoned me for giving congratulation. but Khalid bhai, i cannot understand as to what kind of benefit has been extended to the deprived stenos of grade 14 & 16? Whether only premature increment has been granted? I did not find any thing about next scale/time scale in the order. Would u please clarify it? thanks for clarification and ur efforts. AOA, this O.M does not clear the case of deprived peoples. because deprived persons have not be treated as upgraded and their fixation was not allowed from 23.12.2011. 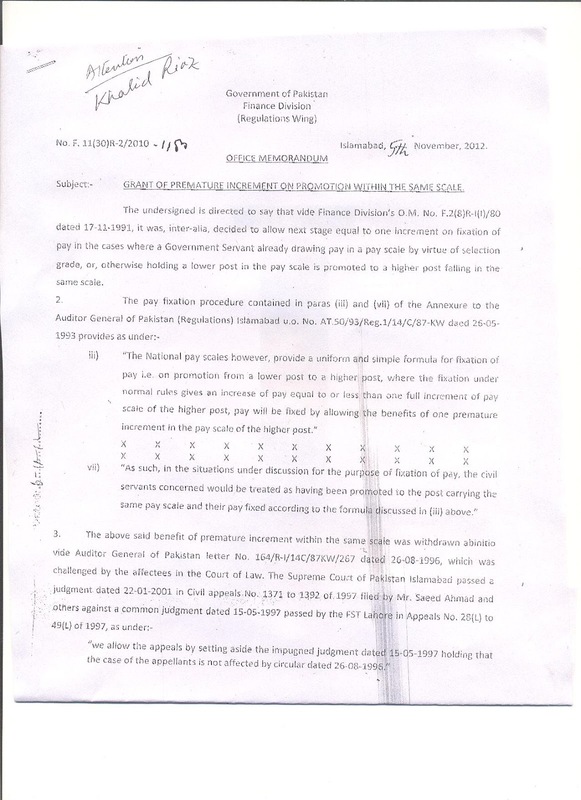 How it is possible that one increment will be allowed , hence the decision for their eligibility that they have been upgraded from B-16 to B-17 is necessary OR clear cut orders be obtained from Finance Division that stenographers already in B-16 are allowed one increment w.e.f.the date of decision of Supreme Court other wise deprived stenographers will be made eligible for one increment. Rehan Aslam Bhai you are right and your doubt is also correct. The position of deprived stenos is not clear the other persons will be benefited instead of deprived. The assessment of Khalid Bhai is not correct in my point of views. May be he will be right in future but at this stage it is possible in the light of this O.M. 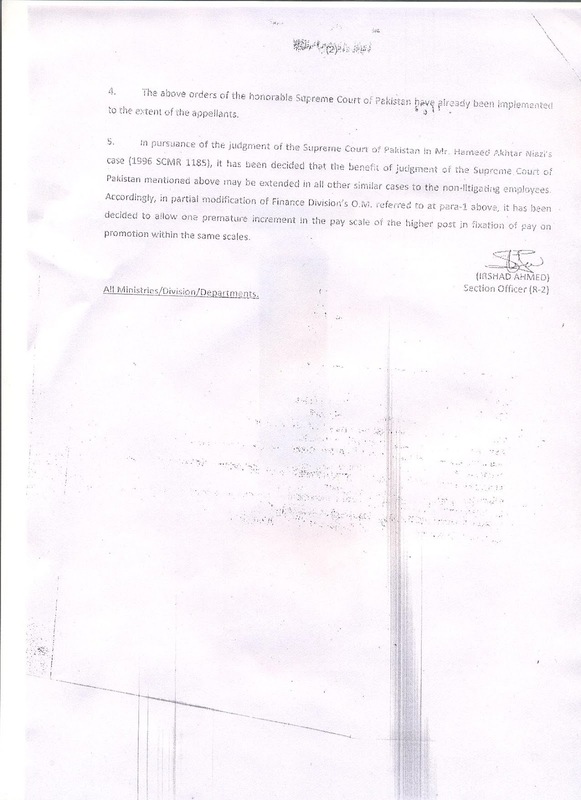 Rehan Aslam Bhai, you are doubt can not be refused because this O.M is not clear and fulfill the requirement of deprived steno's eligibility for grant of one increment. First they may be upgraded and secondly be eligible. At present they have not been treated as upgraded and they not fixed in the B-16 they are being treated selection grade. Even deprived stenos are not given the status of regular stenos in B-16 and fix the benefit of upgradation. There is no cause of happiness to read this O.M. 1. 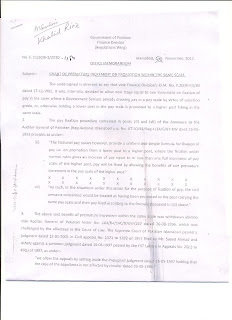 The deprived Stenos already in BPS-14 & BPS-16 by virtue of Selection Grade, prior to 23.12.2011, have already got benefit of premature increment and fixation of pay in the next above stage. How they would further get benefit of increments (next above stage & premature increment or 2 increments) from the F.R. O.M. dated 5.11.2012? 2. The recently upgraded Steno BPS-14 & 16 whose pay was merely fixed in the next above stage without grant of premature increment would now get benefit of only one premature increment or otherwise? 3. Whether the other categories of employees i.e. Assistants BPS-11 etc upgraded in BPS-14 in the recent past, would also get benefit of premature increment like Stenos or otherwise? YES Khalid Bhai this is our mission!!!! "Time Scale from BPS-16 to B-17"
It has been held by the apex Court in the Judgement dated 28.1.2002 passed in CA No.637 of 1998 that up gradation tantamounts to promotion. In my opinion one premature increment is the right of our selection grade stenos. It will be highly appreciated if you please provide copy of Judgment dated 28.1.2002 passed in CA No.637/1998 (if available) as informed by you. BUT I AM NOT FULLY SATISFIED FROM THIS ORDER.........OUR MISSION IS TIME SCALE FROM BPS-16 TO B-17.????????????????. Khalid Bhai, Ap ny yeh likha hy k apka mission time scale from B-16 to B-17 hy. Shyd ap jaldi mn B-14 to B-16 bhi, likhna bhool gae?, Deprived stenos (B-14) ko tanha to nhi chorr dya Bhai Jan ap ny? Aur apna dast-e-shafqat hmary shoulder pr sy uttha tw nahi liya ? Esa na kijiye ga please. Bcoz B-14 stenos b ap ki community k stenos hn aur ap ki force k members hn. Hm B-14 deprived stenos b ap k mission aur efforts sy mustafeed hona chahty hn. Lehaza Please re-read ur comments copied above, and clarify whether the time scale from B-14 to B-16 is ur mission too, in addition to B-16 to B-17.Please clarify. Deprived ko one increment k order to ho gai hain Saifi sahab.Ab Time scale per kam karna ha. Tabi hum ne next mission k baat ki ha.Hamari es Mission ma Stenotypists (deprived), Stenographers (deprived) aur Private Secretaries shamil hain. 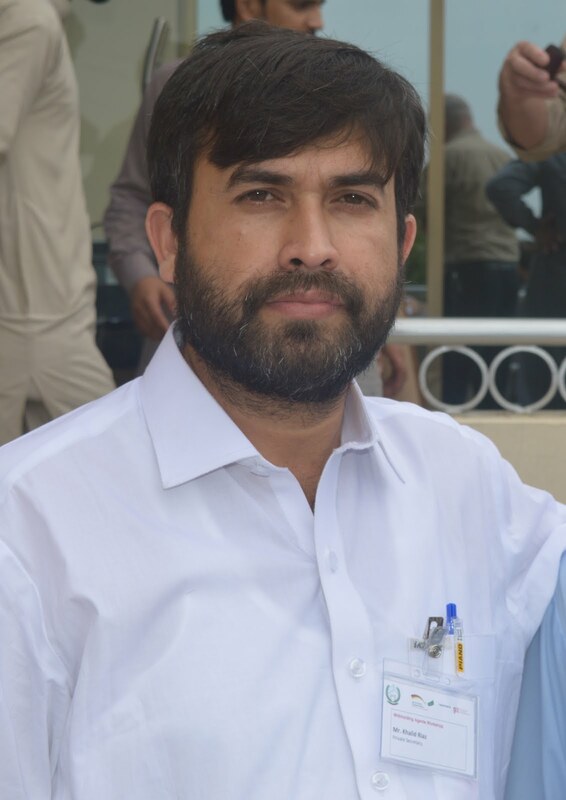 My Dear Khalid Riaz Hero of the all play ,app ki lenghty struggle ka result bhee phaldar hay,aur app ki ais struggle ko sunai haroof main likha jay ga ,kia premature increment ka notification finance division ki tarf say jari hoo chuka hay aur ais ki copy provincial govts,koo mil chuki hain ya aphi kuch time lagay ga,ais ki detail zara ais form par bata dain too app ka booth booth shukria. ye jis per app ne comments di hain yahi O.M Finance Division ne issue kia ha aur es ma app cover hotey hain. some of my friends (not in Senate/assembly) are of the view that a Senate Question be get risen in Senate for knowing the status of deprived stenos in grade-14 & 16 and ask for early relief/ decision. What do you suggest and if yes, then how should the question be framed for Senate? 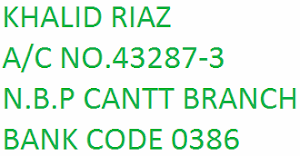 Thanks Mr.Khalid Riaz our hero,for clarification of one increment. Dear Rehan Islam, suggestions of your friends is genuine demand, we should avail all such tactics for deprived stenos, otherwise one day this chapter will be closed like 2011 and a new story will be the heading of newspapers. If you and all other colleagues can help Khalid Bhai and other please put a question in Senate, NA and also in electronic media as early as possible. Because after election these such will automatically closed. The O.M. 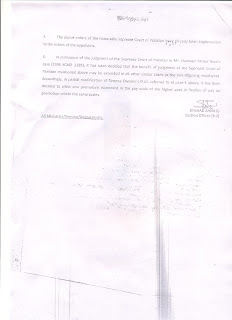 issued on 5.11.2012 is still disputed and not send to offices for implementation.